The FIA have confirmed the Halo device did prevent a part of Fernando Alonso’s car hitting Charles Leclerc on his visor at Spa. 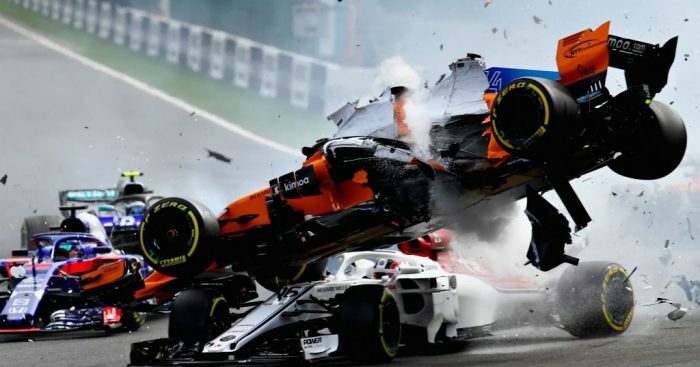 The Belgian Grand Prix was the scene of one of the most dramatic crashes in the 2018 season, when Nico Hulkenberg sparked a collision which saw Alonso fly over Leclerc’s Sauber. All three drivers were unscathed in the incident, with the Halo receiving widespread praise for its role in preventing serious injury. Now the FIA have revealed the exact role the Halo played in the crash. “From the available data and video footage, we are confident that the wheel would not have hit Leclerc’s helmet,” FIA safety director Adam Baker told Autosport. “But, as Alonso’s car continued to yaw relative to Leclerc’s, we believe that Alonso’s front wing endplate would have just contacted Leclerc’s visor. The official report also revealed that, in this particular incident, the Halo withstood approximately half the force that the cockpit safety device is designed to take.